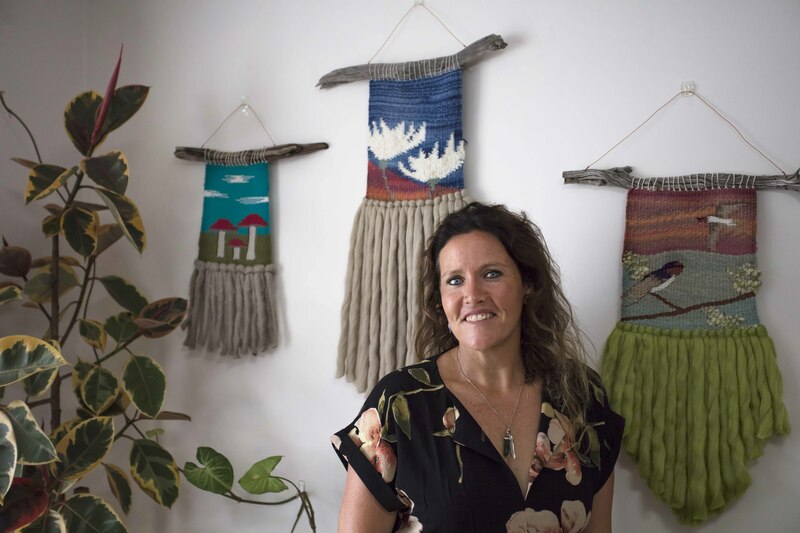 Jaquiline Carmichael is a local artist who draws inspiration from the natural world to produce handmade, woven textiles which draw heavily in their influence from the often simple-yet always magical-world around us. Jaquilines international travels as well as the tiny little observations she has in her own back yard have weaved a rich tapestry of experience in their own right. For the past few years she has been able to express these experiences via the ancient art of weaving, fabricating her own looms and teaching herself to weave to bring warps and wefts together to produce unique and stunning wall pieces. A passionate and dedicated recycler, Jaquiline creates her pieces using recycled, and new yarns which are carefully selected to mirror her vision. In this new collection of works, Jaquiline has observed the birds which frequently visit her back yard, noticing their subtle yet important interactions with the flora and fauna. Her garden a natural weaving in its own right, with each leaf, flower, fibre and bird all subtly connected to form a piece which is the sum of its tiny, magical parts. These observations are referenced in each of her new pieces. Come for an earthly stroll through The Woven Garden, listen to some beautiful tunes at Pukka Health and enjoy the taste of organic unearthly delights and a Butterfly Pukkatini this SALT festival.